A reader requested this insert to help her track her blood sugar reading.. This was one of my earlier versions that I created for personal sized planners. It should be printed on letter sized paper and then cut to size. If I ever redo this one, I will work on giving it a bigger margin. Click here to download. 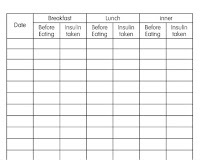 Do you have one like the Blood Sugar Log for blood pressure tracking? Do you have a log for blood pressure?